RV Life Magazine Features Our Buggy On This Month's Cover!! RV Life Magazine Features Our Buggy On This Month’s Cover!! 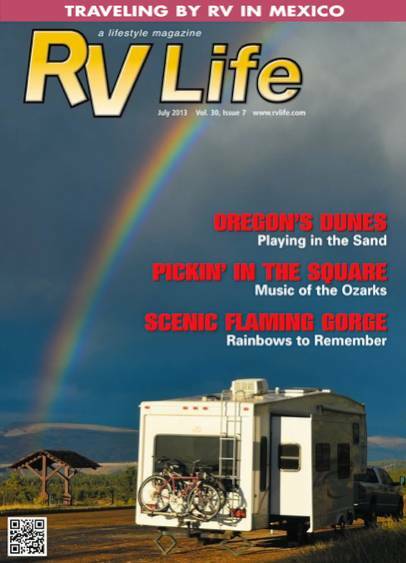 RV Life Magazine is featuring our photo on the cover of their magazine for the July, 2013 issue! Last summer Mark and I spent a glorious week at Flaming Gorge National Recreation Area on the Utah/Wyoming border. This magnificent park is a land of red rock cliffs that plunge into aquamarine water far below, and we were blessed with a myriad of rainbows every afternoon we were there. I took this photo while we were parked at the Greendale Overlook. We stopped to do a hike and have lunch, but in the middle of all our fun the heavens opened up and a deluge of rain poured out. All heck broke loose as everyone in the area scrambled for cover! Once the rain cleared, the most beautiful rainbow formed over our trailer. Our story, Chasing Rainbows at Flaming Gorge, is featured inside this issue, and it tells of some of the other fun adventures we had in this gorgeous park. From photographing majestic views to enjoying intriguing encounters with very tame wildlife in the campgrounds, we loved every minute of our stay there. If you like the story, the online version has a place where you can rate it with 5 stars!! RV Life Magazine is one of the oldest independent regional RV magazines in the US. Over the years, we have really enjoyed our subscription to RV Life because of the high quality travel destination stories and the news stories about the current happenings in the RV industry. The print version of the magazine is available for free at Camping World stores in the western states and/or as a paid subscription. The online version is on their website. For more on the Flaming Gorge National Recreation Area, see our blog posts from the Wyoming side of Flaming Gorge and the Utah side of Flaming Gorge. For more from us, see our other magazine articles and/or our most recent posts! !